The answer is yes, especially for distributed solar capacity. Today, a majority of states, that is 26 states plus Washington, D.C., have now adopted policies that increase access to rooftop solar. Policies allowing an individual or business to have a third party-owned solar panel installed on their property, that they either lease from the provider or from which they purchase power (instead of from a utility) through defined agreement terms, have become more common. 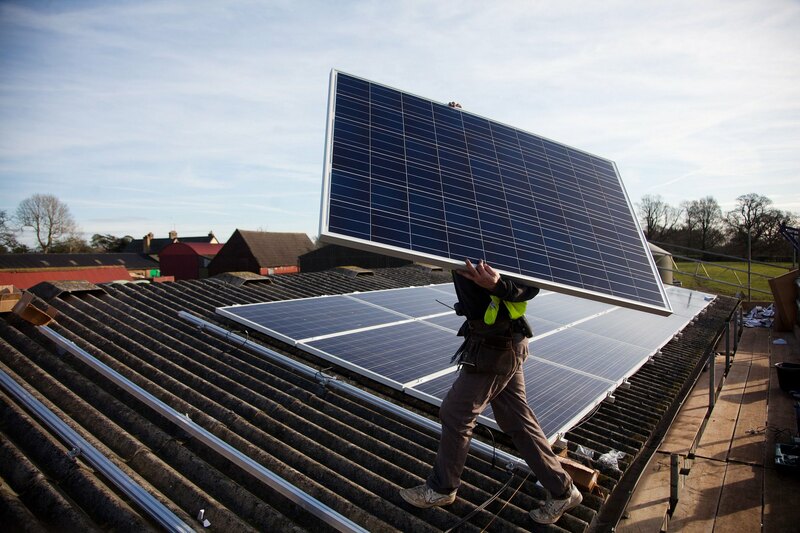 These third-party ownership models remove traditional, upfront barriers such as installation or maintenance costs that prevent wider adoption of solar by those who cannot afford direct ownership or who find available tax credits and utility rebates out of reach or too complex to navigate. In recent years, states that haven’t made third-party ownership possible have lagged significantly in distributed solar deployment. The following table shows the top 10 states in distributed solar per capita in 2017. 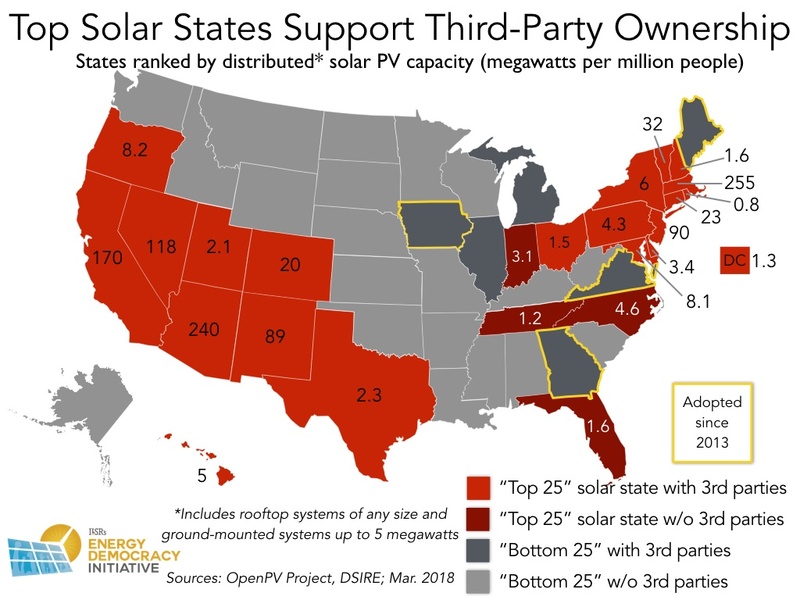 What’s clear is that third-party ownership policy continues to matter—every state in the top 10 in rooftop and small-scale solar still allows for third-party ownership. The trend doesn’t stop there. The “top 25” states make up a notable 99.6% of the reported capacity in the country, all boasting capacity greater than the nationwide median of 0.81 megawatts per million persons. Unfortunately, with the top contenders and majority of distributed solar capacity concentrated predominantly in the Northeast and Southwest, as illustrated by the map below, states in the rest of the country—mostly those that don’t allow third-party ownership—have a long way to go to catch up. Even with gains in solar capacity from policies enabling power purchase or lease agreements, simplifying access to solar for the consumer, third-party ownership models can also come at a cost over the lifetime of an array when compared to direct ownership. In addition, because a few centralized providers still dominate the solar market, dollars spent on lease agreements or power purchased from third party-owned solar arrays continue to leave the local economies where solar technology is installed. With this in mind, states that have not yet enabled solar power purchase agreement markets could instead choose to pursue different strategies to grow their solar capacity. They could, for example, make it easier for direct loan financing, drawing inspiration from the success of the Connecticut Green Bank, or invest in cooperative ownership models, such as Yampa Valley Electric Association’s Community Solar Garden in Colorado. States have the opportunity to create policies and new models of solar financing that keep investments local and are more inclusive of those traditionally left out of the conversation, including low income communities. Doing so will continue to grow both capacity and community power in the distributed solar market nationwide and can give states a competitive economic edge. Photo credit: 1010 Climate Action via Flickr (CC 2.0).